Thinking about getting in to VR gaming? Well, the Playstation 4’s new VR headset, PS VR, is one of the best high end headsets currently available. And to make it all the sweater, it’s also the cheapest. But what exactly do you need to get the headset work? Apart from the headset itself and a PS4? I asked myself that same question and thought you might be interested as well. So after doing my research I put together this guide to help you make the right choices when buying your headset. So, read on to find out exactly what you need to enter the dazzling world of VR gaming. Originally released on the PS4 at launch, The Playstation camera was only used by a very small handful of games. Underused the camera never reached it’s potential and was essentially forgotten about. All that changed when Sony teased they had a new VR headset in the works, Project Morpheus, that would make use it. Sony went one step further and even said that the camera was always intended to be used for a VR set up. But more importantly you needed the camera for the VR to work. Fortunately, for something that Sony has made mandatory, the camera has good build quality and and was designed to look unobtrusive by your TV. For example it has a small sleek body made from a durable black plastic that would fit in with any TV setup. No sore thumbs here then. And to help add it to your already over populated entertainment TV collection, Sony has seen it fit to include a camera stand. This little bit of plastic lets you place the camera at the top or bottom of the TV. However, in contrast to the camera’s near universal ease of use, it can be a little bit fiddly to place as the thickness and stiffness (no laughs please) of the wire coming out of the back gives the camera tendency to turn away from it’s intended direction. Pro tip: 2 rubber bands and a thin brick to hold it place does the job. But, that minor problem aside, the camera looks the part. Without standing out needlessly to destroy the look of your entertainment setup. And the camera exhibits just as high a quality on the inside as on the out. Technically the camera has 2 lenses so it has stereoscopic vision. This lets it track object such as the VR headset or move controllers in 3d space. It is extremely accurate and picks up even the smallest twist or turn. Additionally, the camera comes complete with a microphone so, in a pinch, it can be used for voice over communications. Though it’s technology is basic and dated, it does what it needs to do and that, as far as the VR is concerned, is all that matters. Sony have a good camera both Physically and technically. But, even if the camera was terrible you still need to for the VR to work. So, if you don’t have one yet go and get one! 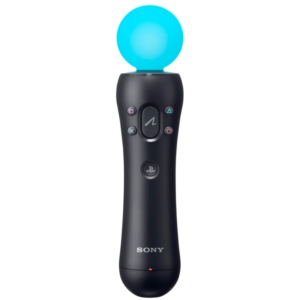 Originally released for the PS3 in 2010, the PS move is a motion controller that was designed to compete with the then extremely popular Nintendo Wii. With it’s eye catching glowing orb, the Move was designed to be more accurate in every possible way. A Wii-mote on steroids if you will. It was well received by the public and critiques alike but never really had the games or the support it needed to flourish… Until now. A well made ergonomic devise that was designed to feel good in the hand. On first glance everything about the devise scream quality. It comes with all the buttons you would expect from a Sony device but, with one small break away from the then traditional Sony controllers. It had, on the underside, a trigger button that felt perfect when used in FPS games. It really did feel like pulling the trigger of a gun. Amazing and a little disturbing. And now with the added immersion of VR headset, the Motion controller makes it all the more real. However some question marks remain over the general build quality of the unite, which hasn’t been updated since it’s PS3 release. The plastic body can sometimes flex and creek when gripped tightly. Which makes for a few, ‘ow crap have a broken it,’ moments. 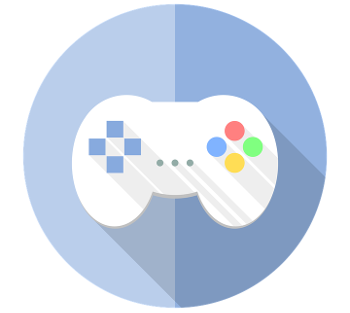 Additionally the small Playstation face buttons, X, square, triangle and circle, look as if they were designed to be used by a rather small mouse. They are just to small and often lead to in game mistakes. Overall, the controller does feel great in the hand despite these small issues. But good looks will only take you so far when it comes to motion controllers. Fortunately the Move proves to be class leading in its electronics too. When married with the PS camera you get an extreme level of accuracy that feels many magnitudes higher than what a Wii Motion Plus could ever offer. We are talking about 1 to 1 gun and sword movement. Why nobody has ever made a proper Star Wars light-saber game truly baffles me. But developers, if you are reading this, Come on! You know the world wants a light-saber game! Anyway All this super accurate magic is owed to the inclusion of a number sensors. These include, but I stress are not limited to, a gyroscope and a six axis sensor. Yes, the same in the PS3 Controllers. The controller should have been a game changer when it first came out but that was not to be. But now re-purposed, Sony have a ready made controller that easily rivals, and in many ways exceeds, that which HTC and Oculus offer. And you get all of this for a fraction of the price. Plus, many games for the PS VR headset need the Motion controllers to work. If you have your heart set on games that need them, you better get hold of a couple right now. You won’t regret it. With a PS VR, Motion Controllers, normal controllers and more wires than you need to make a suspension bridge, you are going to need some sort of management system for everything. You want somewhere to charge the controllers without stepping on them. You want somewhere to for your VR headset to call home when your not using it. After all, you don’t want to keep the headset on chair just waiting to be crushed by some unsuspecting backside. 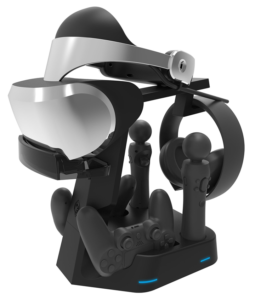 No, you need to get hold of PS VR Collective minds Showcase stand. This stand will help you organize all your peripherals and keep them safe. That’s it. But do you really want to leave your $400 investment on the floor? I didn’t think so. Fortunately this stand offers not only the ability to stand your VR headset in safety but actively show it off. You can also place and charge 2 motion controllers, 2 normal controllers and there is even room for a pair of headphones. And you do all this with only one wire coming out of the back of the stand. Simple storage, simple recharging and everything kept safe. But these days we live in a world obsessed with good looks so you can’t just have a great unite that organizes your peripherals. No, its got to look good to while it does it. Thankfully the Collective Mind’s Stand proves it is up to the task of pleasing you with it’s undeniable good looks and shinny black plastic. Talking about plastic, the stand is extremely sturdy, considering plastic has a habit of being a bit flimsy. 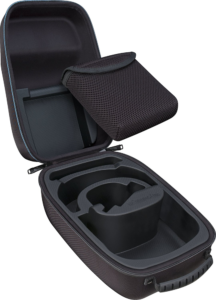 Overall you are going to need something to store all of your expensive VR peripherals and you don’t want that to be the floor where you might accidentally stubble on them or spill dodgy liquids on them. Keep them clean. Keep them safe. Store them when not using them and there will be no tears. You need a stand, plain and simple, and this is the best you can get. You have spent a Lot of money on your headset. And like any gamer, you want to show off your new gear and take it around your friend’s house. But you want to protect it while on your way over there right? You don’t want any pot holes shaking you, the car and the headset to pieces while on the road do you? Of course you don’t. So you are going to need a case. First let me give you a few reasons why you might want to get a case for your headset. You see, a VR headset has to light otherwise you get fatigued pretty quickly playing. Unfortunately to achieve this feather like weight, most of the headset is made of plastic. And not exactly the sturdiest type either. Not only that but it has a large amount of moving part. Moving parts and plastic usually only lead to one thing. Disaster. These things are in the habit of breaking very easily. Something you might want to avoid. To that end, the RDS case was designed to hold your headset safely and snuggly and protect it from any accident, short of a direct asteroid (or is that meteorite) impact, you can think of. It has a hard outer shell so it can’t be crushed. Inside is padded foam which has been shaped and moulded to hug the contours of the VR headset like a lover. Needless to say your headset will have the very best protection. In addition to this protection, you get room for a number of accessories. You can stuff in a move controller and normal controllers. There is room for all the wires you will ever need and the VR companion box. There is even room for games. There might even be room for a small snack if that takes your fancy. Your VR headset is a very expensive but extremely delicate peace of technology that deserves to be protected. You need a great case for it and you can’t get much better than this one by RDS Industries. Vr is, without doubt, the most immersive thing to ever happen to gaming. But with the right pair of headphones you can propel your immersion into the stratosphere. Fortunately for us, Sony have put together a great pair just for PS4 and VR gaming. 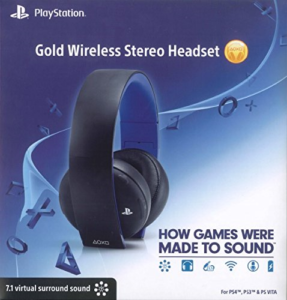 The official Sony gold headphones are a great choice for any gamer getting into VR. The headphones are, as you would expect from a Sony product, very well made. This solid build quality is backed up by a hardened black plastic shell that is designed to be able to stand up to the harshest punishment. So when you get annoyed by another lost game of Madden, you an chuck them at a wall and they, probably, I say probably, wont break. Along with a tough exterior, the headphones have been made comfortable to wear. The least you would expect for this price point. But Sony have seen fit to include memory foam ear cups for you comfort induced pleasure. Which is great. From a usability standpoint you cant beat the simple yet able design of these Sony ear huggers. Along with great external design, the Sony cups are a technical tour-de-force with exceptional sound quality. For a quite frankly tiny price, Sony has managed to squeeze in 7.1 virtual surround sound. I applaud this achievement, I really do because headphones double the price of Sony’s effort often don’t include surround sound of any sort. And this surround sound loveliness isn’t just for show. Along with this you get very high base levels which make explosions feel like somebody just detonated a stick of dynamite next to your chair. But this great Base is coupled with tremendously good quality in the treble range, Voices and gun fire sound crisp and not drowned out by the heavy base. The only criticism I can lay upon the Sony headset is the midrange can be a little muffled which was likely sacrificed for the punchier base. But overall you wont find a pair of headphones that offers this level of sound quality at this price point. The official PS4 Headphones will blow your mind with thumping base and super high trebles. And it’s all housed in a neat black package. This headset is going to put your immersion levels through your roof.